eirigi have issued an urgent action alert for the release of interned political activist Stephen Murney. Then they came for the trade unionists and I didn’t speak out because I wasn’t a trade unionist. Over the last number of decades a pattern has emerged across the ‘developed’ world whereby legal powers that were once considered to be ‘extraordinary’ or ‘special’ have become integrated into the ‘normal’ legal system. In many instances this transformation from ‘special’ to ‘normal’ is achieved under the auspices of protecting ‘state security’ and/or fighting ‘terrorism’. In many cases this process has been accelerated through ‘test cases’ which set legal precedent for future cases. it will set a legal precedent which will have deep and far-reaching consequences for activists across the political spectrum in Ireland, Britain and beyond. It would be extremely naive to believe that a precedent established against an Irish republican today would not be used against a socialist, anarchist, environmentalist, trade unionist, whistleblower or other political opponent tomorrow. 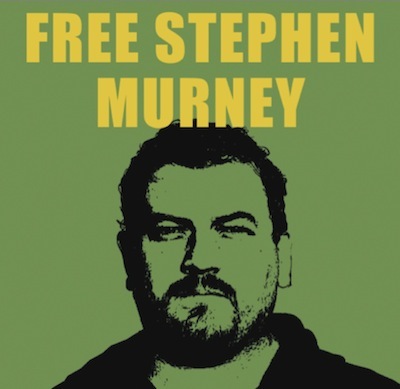 All who claim to stand against injustice and for human rights are duty-bound to support Stephen Murney and the campaign to have him released. * Highlighting Stephen’s case with human and legal rights organisations such as Justice Watch Ireland, Amnesty International, The Pat Finucane Centre, etc. * Tell your family, friends, workmates and neighbours about Stephen’s plight and encourage them to add their voices to the campaign for Stephen’s release.